How to make a Web crawler using Java? There are a lot of useful information on the Internet. How can we automatically get those information? - Yes, Web Crawler. This post shows how to make a simple Web crawler prototype using Java. Making a Web crawler is not as difficult as it sounds. Just follow the guide and you will quickly get there in 1 hour or less, and then enjoy the huge amount of information that it can get for you. As this is only a prototype, you need spend more time to customize it for your needs. A little bit about SQL and MySQL Database. If you don't want to use a database, you can use a file to track the crawling history. Parse the root web page ("mit.edu"), and get all links from this page. To access each URL and parse HTML page, I will use JSoup which is a convenient web page parser written in Java. When doing the above steps, we need to track which page has been processed before, so that each web page only get processed once. This is the reason why we need a database. If you are using Ubuntu, you can following this guide to install Apache, MySQL, PHP, and phpMyAdmin. If you are using Windows, you can simply use WampServer. You can simple download it from wampserver.com and install it in a minute and good to go for next step. I will use phpMyAdmin to manipulate MySQL database. It is simply a GUI interface for using MySQL. It is totally fine if you any other tools or use no GUI tools. 1). Download JSoup core library from http://jsoup.org/download. 3). Create a class named "DB" which is used for handling database actions. 4). Create a class with name "Main" which will be our crawler. Now you have your own Web crawler. Of course, you will need to filter some links you don't want to crawl. The output is the following when I run the code on May 26 2014. Thank you for this simple but yet powerfull crawling app. I was actually learning to develop a crawling program in Python, then I had the ideal to look for the same kind of program in Java. I’m pretty satisfied with your blog post. Awesome work! i want to extract research based publication databases..
hey, thanks so much for the upload! 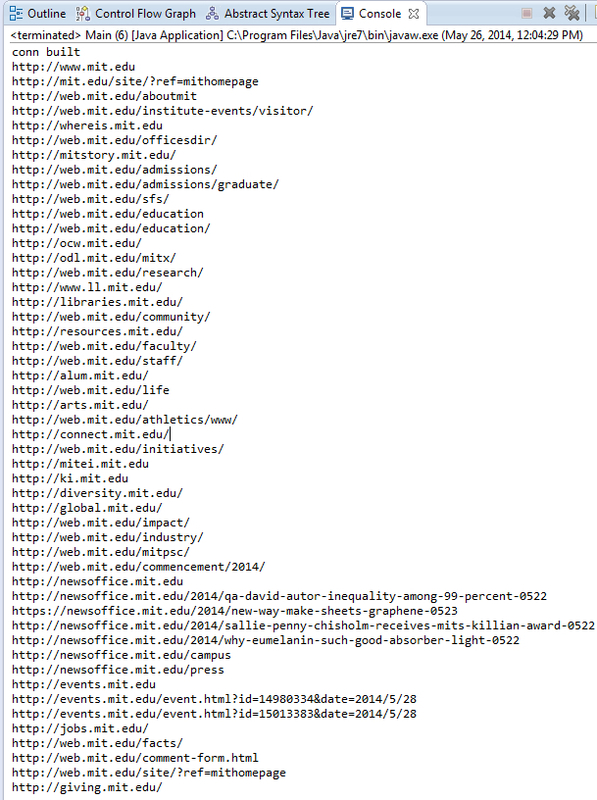 I am just wondering why I can only extract data from mit.edu? how can i use this program on other websites? Rather than complicated this with use of DB, u could have simple used some java collection like Set to store traversed URLs. I guess many finding problem here with setting DB connectors. Yes, I found it useful. Why i am having this error while compiling the program.Please help me . I want the content of that url..How does it works. I am getting this error how to resolve it????????? I copied the exact same code but I am getting only the links present in http://www.mit.edu/ . It’s not returning all pages that contains a string “research” ..Please help ..
i could run your program successfully but when i change the URL it gives my error of unknown host exception can you help? how do I extract and store images and emails from a webpage to my database…. I am able to write data to file but it shows “ClassNotFoundException” when trying to use daatabase. Ho do I solve that issue. can we use this program to crawl multiple websites? and not just one(www.mitedu.com)? TO all those guys who are having this error, It is a database related error which states that the connection to the database was not successful due to the incorrect parameters you supplied to make a connection i.e. Check your password for connecting with your database. The default password in wampserver is blank “”. Console isn’t displaying anything when I run it… but I’m not getting any error messages either. Anyone know what’s going on? Hi, Im new to making web crawlers and am doing so for the final project in my class. I want my web crawler to take in an address from a user and plug into maps.google.com and then take the route time and length to use in calculations. How do I adapt the crawler you provided to do that? Or if not possilbe, how do I write a crawler that can do that operation? Thanks for this wonderful code that you have put up! Makes writing the first crawler very very easy! Well, the problem that I am currently facing is that I am not sure of how to distinguish between a page that has an article like: http://tech.firstpost.com/news-analysis/new-twist-trai-says-war-between-telco-media-house-caused-net-neutrality-debate-263618.html and a page that has many links to other articles like: http://tech.firstpost.com/. Is there some meta tag or some other mechanism that exists to distinguish between these two types of pages? I also want to filter out pages that photos, slideshows, links to social media accounts, etc. Other than checking for words like ‘photo’,’gallery’,’slidehow’,’plus.google.com’ in the URL is there any way of filtering these out using some smarter jsoup(any other api) utilities? After inserting 46 rows, it refuses to insert any more in the database. How to insert the rest of the links? Also, using a database for tracking is a bit over-engineered since it is cleared on startup. However, it will come in handy if you want to track which pages has been crawled if you stop the process and want to continue later on. Thanks it was a very good starting point…. Im getting this sort of an error on running my java code. Any ideas? We can use selenium to crawl a website. See below code. It will open firefox window and will crawl a website. I think this is the simplest way to do it. Hope this will help to all of you. I’m getting an error “java.net.ConnectException: Connection timed out: connect”. I recently placed a “timeout(0)” before .get() on the Document. Is there any other solutions for this? My firewalls are completely shut off. Do you have a java to mysql connector? I do not get a response from the server, cause by line: Statement sta = conn.createStatement(); (NullPointer Exception). Does anyone know what the problem might be? Hey it works for me except the “db.runSql(“TRUNCATE Record;”);” I keep getting the error “Exception in thread “main” java.sql.SQLException: Can not issue data manipulation statements with executeQuery().” When I comment out the line, everything works great? This line might have a bug. I think it should have abs: in it so that relative URLs are changed to include the domain. If I want to crawl to the specific keyword inside the webpage. how can i do that? can u please help me out on this one? I can never find a java source that shows a proper crawler. All of these limited to domain specific things. Would be cool if someone did a writeup of an actual commercial style crawler ( kind of the point of a crawler ) because there are already a thousand simple programss for small range collection. Hi, I am in the mySQL database guide under step 2 and trying to create my new site in Apache2 (under Virtual Hosts). After I run the command gksudo gedit /etc/apache2/sites-available/mysite.conf and access the file, I can’t find the Directory directive to complete step 4. When I don’t follow his step, http://localhost doesn’t work, giving me the error that “I Don’t have access to this page.” Help! If you are using Wampm I’m pretty sure you did not get rid of the password field mentioned in the DB class. Wang, Thanks. I tried the code and I am now search all the pages I want and getting my results per keyword i choose. This is very good and appreciate your gesture in schooling us. Netbeans’s console displays nothing !!! This is amazing and so easy to implement. Thanks for sharing you knowledge. I think some part with reference link is ok, but the whole page of the content is not. I had one question, if I use web Crawler and showing that data or information in my own site. Is it legal or we need to take permission to those URL owner. hey thanx a lot bro… i use to think that making a crawler is a big deal u know.. but never new it is that easy..
it took me a couple of minutes to understand .. u made my life a lot easy …thanx n god bless.. cheers!! This is my lab assignment! Copy-Paste it! Could you tell me what does this code exactly mean? Because my aim was to add the entire sourcecode of each page taken by the result of the .get() into my database, and not only the URL. I’ve already made a new column called Source where i want to save it, but i can’t find the right query. When I run Main, it only shows the “conn built”, And I see that in the Record Table stores all URLs inside the HTML page when I open it from PHPMyAdmin. But nothing more is shown in the console. I tryed changin PhD for other word. And something strange is, when I ran few more times, it keeps displaying all the URL (with no filter) in console. Don’t no why it doesn’t do anymore that. Now I try and it only does what I said at beginig. Thank you for this :), but you are only processing the links on the first URL http://www.mit.edu/. Because in the Jsoup.connect, it should be Jsoup.connect(URL) instead of Jsoup.connect(http://www.mit.edu/). I m working on project to develop a web crawler for YouTube. .so can u help me? ? or give some ideas.